Last week, we looked back quarter of a century to the floods that took place when the River Lavant burst its banks. The disaster’s less immediate effect was sending a flood of historians scurrying through the records to find out when things were last as bad as it was in early 1994. James Spershott, who lived from 1710 to 1789, penned memoirs on Chichester’s history, writing in 1771: “The new bridge over the Lavant without the East Gate before which the water lies open, spread wide and, when the springs were high, flow’d from within a few yards of East Gate into the Hornet as far at the Poor House, and was so deep in the current that I have seen it above the beds of the waggons. In December 1839, the Hornet and the road without West Gate were inundated by the Lavant overflowing, and a few years later in December 1852, the Lavant again overflowed its banks and inundated the Pancras and the Hornet. The road by Dell Hole and Franklin Place was also flooded after almost incessant rain for six weeks. In November, 1894, a hundred yards of the Hornet were flooded and local landowner Mr E T Habin made several vehicles available for public use so inhabitants, particularly schoolchildren from Portfield and Whyke, could get into the city. An unlucky February 13, 1899, saw York Road in Bognor navigable only by boat. Stormy seas often left York Road awash, but while the local fishermen ferried people about their business, Mr W. P. Marsh, acclaimed local photographer, was out recording the mountainous waves for posterity - and for his part, prosperity. In 1893, several of Mr Marsh’s studies were enlarged and displayed in a London shop window. Views of a wave-drenched seafront, immediately east of the pier, proved so popular that large crowds collected and police complained of the obstruction caused by the display. Such photographs won Mr Marsh the Royal Photographic Society’s medal and prints were in demand in America and Europe. St Pancras in Chichester saw further flooding in 1927, with residents donning heavy boots to wade through the waters. 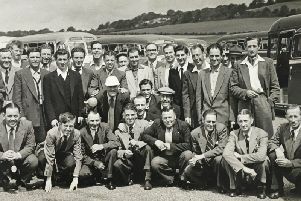 At the end of October 1960, swirling floods caused by heavy rain brought traffic in Bognor to a standstill on the main roads. At one time it was proving impossible to reach either Littlehampton or Chichester and Yapton was cut off completely for 22 hours. Lewes was the most badly hit town at that time, where the River Ouse rose three feet above street level, and the nearby railway line resembled a canal. Again in December 1960, flooding hit in Chicheser. Wearing rubber boots and armed with buckets and mops, shopkeepers and householders in St Pancras anxiously watched the water level of the River Lavant. Many had been hit hard by the flow which burst from the river after a gale, rising above sandbagging and pouring into the cellars, kicthens, shops and showrooms. In 1983, a ‘freak tide’ caused severe flooding along the south coast, and at Elmer Sands a 98 year old woman was evacuated by the social services when her home was threatened by flooding. Luckily, severe floods are not too common an occurrence in our area. St Pancras in Chichester saw further flooding in about 1927, with residents donning heavy boots to wade through the waters. 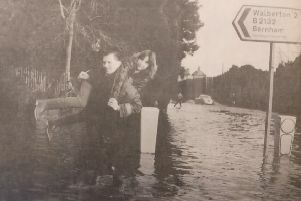 Again in December 1960, flooding hit in Chichester. Wearing rubber boots and armed with buckets and mops, shopkeepers and householders in St Pancras anxiously watched the water level of the River Lavant. Many had been hit hard by the flow which burst from the river after a gale, rising above sandbagging and pouring into the cellars, kicthens, shops and showrooms. Right: Boats were the best form of transport in 1899 when stormy seas came over the promenade and flooded York Road and other parts of Bognor. Below: Waves pounding the promenade, east of Bognor pier, captured in 1899 by Mr Marsh.